Using a sharp knife, trim off any extra skin around the duck breasts. The skin should just cover the meat, not overhang at all. Also, slice a few slits into the skin with your knife, being careful not to cut into the meat. Season the duck breasts with salt and pepper and place them, skin side down, in a dry, cold, large skillet. Place the skillet over medium-high heat and cook for about 5 minutes. Starting the breasts in a cold pan will help the fat render out of the skin. After five minutes, the skin should be starting to brown and the fat should be rendering out nicely. If it isn't browning, turn up the heat a bit. If the skin is browned, flip the breasts so they sear on the bottom side. Cook for about 2 minutes, then flip back over to the skin side. Add breasts to a 400°F oven and bake for 4 minutes, skin side down. If your pan is oven safe, you can move it right to the oven, otherwise transfer your duck breasts to an oven-safe dish. Remove breasts from oven, flip them (skin side up now), and baste them with maple glaze. Return to oven for 4 more minutes. Remove from oven and glaze again. Let breasts rest for 5 minutes. Slice duck thickly (1 breast should be 4-5 slices) and serve immediately. Duck is one of those things that most people only think of as a restaurant food. Meaning they would only order it in a restaurant and never in a million years think of cooking it at home. But, there's no need to be intimidated! Duck is just a bird, like chicken, and honestly it is pretty easy to prepare. Also, as people get more adventurous, duck is available in most good supermarkets and almost every butcher worth their salt will have some ready for you. For this maple glazed duck breast, just make sure that you get the breasts with the skin on. You can get duck breasts without the skin, but really, you should get them with the skin still on. The skin on a duck is the best part! That said, the duck breast can have a bit too much skin sometimes. So there is some preparation you need to do before we can cook the birds. Start by trimming off any extra skin around the breast. You want the skin to cover the breast, but it shouldn’t be overhanging a lot. Then, because the skin and fat is so thick, you want to take a sharp knife and score a few slits right in the skin. This will help some of the fat render out in the skin. Just be sure not to slice into the meat itself or it’ll dry out as it cooks. The challenge with cooking duck is that the skin layer is really thick. It’s a very fatty bird. You would be too if you had to hang out on a cold lake all day! When you’re cooking duck, there are three competing concepts that we’re trying to perform at the same time: 1) Render out as much fat at possible from the skin. 2) Make the skin crispy. 3) Not overcook the bird (a nice medium – still a bit pink on the inside is about right). When you’re starting to cook the duck, place it skin-side down in a cold, dry skillet. This will let the skin heat up slowly which will start rendering out a lot of that fat. If you have any extra skin that you trimmed off, you can add it to the pan also. It’ll render down and give you lots of good duck fat. Letting the duck rest will let all the juices redistribute in the meat. 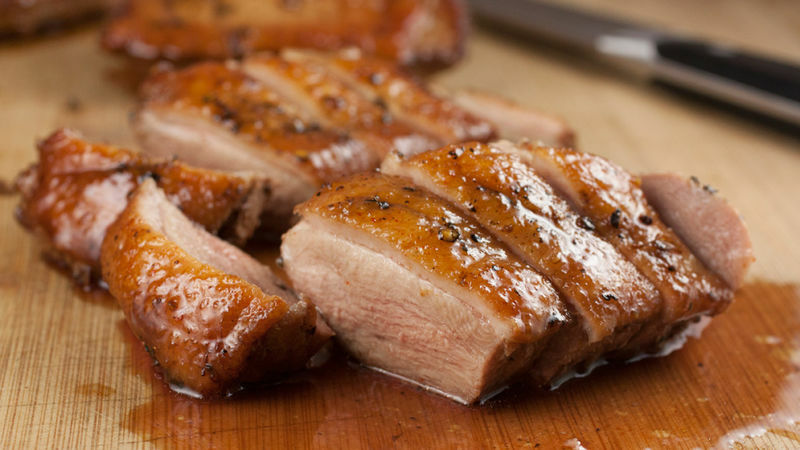 When slicing your duck, slice it into thick slices so they stay warm. One breast should end up being 4-5 slices. You could serve this with a lot of things, like Israeli couscous and some steamed vegetables. While it may have a slightly maple flavor, you should save the rendered duck fat for other cooking uses. It’s awesome to cook potatoes in. Not everyone is a fan of duck, but if you like it, you need to try this. The maple glaze is slightly spicy and sweet and gives the duck a really nice flavor. Duck, Duck, Cooked Duck Recipes Now that you've mastered cooking duck at home, give one of these duck recipes a try!